Nano IT Review 2019: Is Nano IT a Good Hosting? Nano IT is a Latvian-based website hosting provider offering Linux hosting, virtual private servers, colocation, and domain registration. Founded in 2006, Nano IT is a Latvian-based website hosting provider. They currently host over 15,000 domains in many European countries including Latvia, Lithuania, Estonia, Russia, Finland, and Italy. Their data centers are housed in Latvia, and their website can be switched between English, Latvian and Russian. Nano IT has excellent quality data centers. These are owned and operated by Nano IT themselves, which is relatively uncommon since most hosting providers simply resell other providers’ servers. By owning their own servers, Nano IT can provide a higher standard of service and faster support. The quality of their technology is clear. In 2009, they built a new data center just one kilometer from a new power station. The power is supplied by two transformers, so that the second one can take over if the first one fails. Likewise, they have two internet connections in case of a system failure. One concern I have is that despite having on-site data center staff, this company will only provide help up to ten times during working hours, and one time outside of business hours. I think unlimited help should be included in the cost, and I would want an engineer to assist me whenever a problem occurs regardless of any arbitrary cap. Unfortunately, this provider’s pricing is slightly more expensive than both local and international competitors. However, you might be prepared to pay a little more for these added extras bundled into the base packages: free domain, unlimited traffic, free migration, free setup, and free DNS management. It is possible to purchase website hosting from Nano IT on several different contract lengths including one, three, six, and twelve-month terms. The longer you commit, the higher discount you get, up to 15%. There is no free trial, no free version, and no money-back guarantee. Customer support is limited to telephone and email, which is a pity because I prefer to initiate a live chat rather than sending an email when I want some support. But whenever I have emailed them, I have received a prompt response that has fully answered my question. My only other gripe is that they do not clearly advertise their business hours on their web site. Nano IT offers some excellent features and uses its own top quality data centers and servers. They work with some large customers including Reval Hotel Latvija, US Embassy Riga, and Park and Fly. 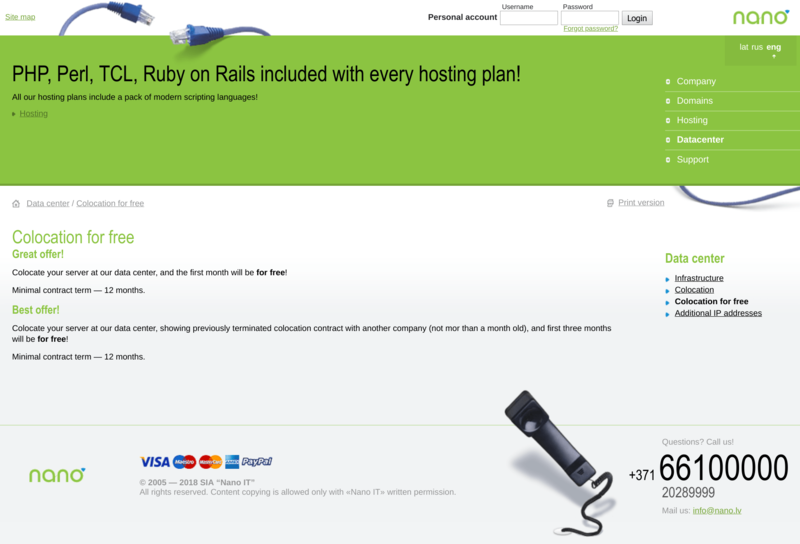 Wondering how Nano IT stacks up against other Web Hosting companies? Enter any other Web Hosting company and we will give you a side-by-side comparison.